After the enormous critical and sales success of Warriors of God, MMP is proud to present the grandfather of Warriors of God, Nakajima’s masterpiece, Warriors of Japan. Long considered one of the greatest games to ever be published in Japan, Warriors of Japan will feature much of the same system as we have seen in Warriors of God. The game covers the Nanboku-cho period of Japanese history and simulates one of the most dynamic and important periods in Japanese history. From 1336-1392, all of Japan was aflame with war. After the fall of a corrupt and ineffective emperor, the two great courts of Japan dueled to determine the future ruler of the country. 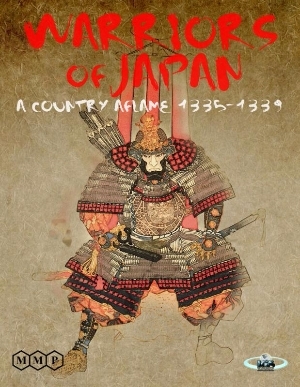 Warriors of Japan covers the vital period following the destruction of the Kamakura shogunate and the fight to find a successor. Players of Warriors of God will find much familiar here, however, unlike the enormous time period covered in Warriors of God, Warriors of Japan covers only 4 years. Subtle changes in the system to cover this unique period have been exchanged inWarriors of Japan. For example, Leaders no longer die from old age but rather can switch sides unexpectedly during a combat. Subtle changes in the movement and combat rules will add to the strategy to a greater extent than in Warriors of God. A random game start generator will keep each game fresh and interesting. Warriors of Japan also brings us home to our wargaming roots. To learn and discover some new period of history that we didn’t know about before in much the same way we discovered history through our wonderful hobby in our youth. Don’t miss out on this truly remarkable game.